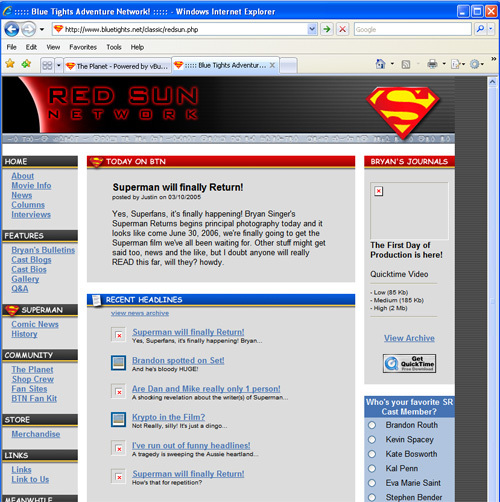 With WB on the phone, and the Superman Returns film production crew wanting to talk to us about some cool fan outreach opportunities, my mind of course went to the design of the site. I wanted to redesign it to feel a bit more serious, or at least a little less amateurish. This History update is a look at some of the concepts that were thrown around during this brief period of confusion. Click to view the image at full size. Part of this “serious” upgrade was the exploration of including “featured” articles and a carousel, like most “serious” online news and blog sites have. The upper left layout was a layout we tried to make work, but ultimately wasn’t feeling right. The two layouts on the right were both part of a push to broaden the “network” part of BlueTights. We were looking at branding sections of the site to cover everything from games to television and comics. Those concepts were eventually moved out into their own site entirely, DC-Kingdom, but that project didn’t last very long due to time constraints. 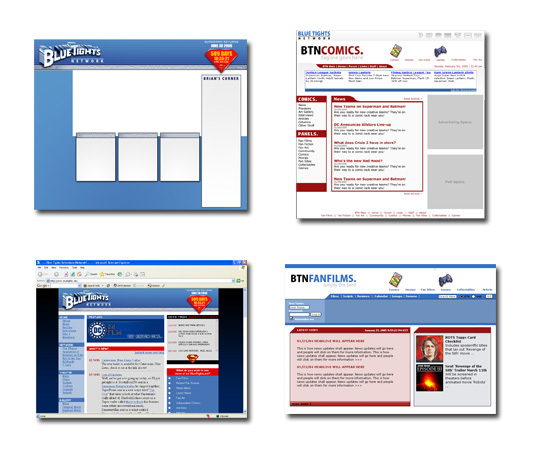 The fourth concept shown here (bottom left) was much closer to what the site ended up being for the launch of the Singer blogs, but even it wouldn’t last long.